In the final song of the musical Hamilton, Alexander’s wife, Eliza, recounts how she worked to keep her husband’s legacy alive. The ensemble also recounts Eliza’s accomplishments over the fifty years since Alexander’s death in a duel in 1804. As Eliza sings the last note and just before the stage goes dark, she emits a gasp. According to one interpretation I read, at that moment in the show, she has broken through the fourth wall and is surprised and satisfied to witness a captive audience listening to her story. There is a satisfaction in telling stories, especially when they are our own. Think of how many stories you have told. How many more you carry. Hundreds? Thousands? Do we collect a new story every day? A few years ago for Mother’s Day, I gave my mother a blank journal, and asked her to write stories about her life. Why don’t I just tell you my stories and you can write them? she asked. You’re the writer. It was my mother’s inclination to writing and grammar that led me to study English. She is also a great story teller. Just set aside an hour and write about one specific memory, one story, I said. It doesn’t have to be an autobiography. A few days later my mother called and read a story she had written about a pair of shoes she bought for Easter when she was a child. It was priceless, complete with colors and feelings that only could have come from her. I believe that personal stories are like fingerprints. The more details we can recall from them, the more unique they are. 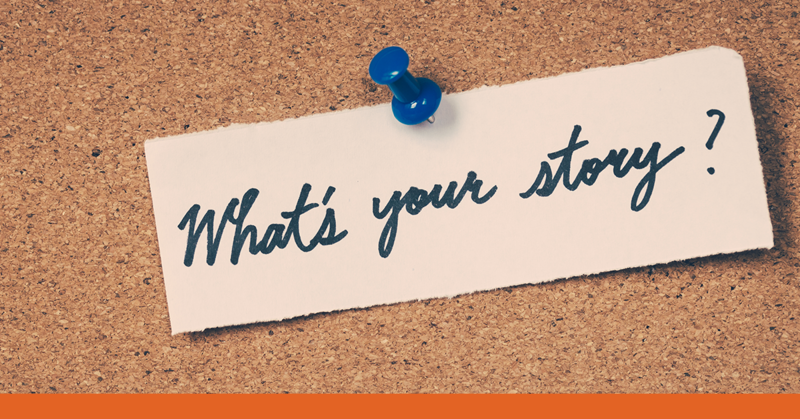 So, how do we write our stories? I like the vehicle of poetry. If done well, a poem is a morsel, rich with imagery and feeling. If you prefer long-hand, creative non-fiction is also an effective medium for telling our stories. The important thing is to follow the Nike maxim and just do it. In her book on writing, Bird By Bird, Anne Lamott relates her father’s advice to her brother for completing an ornithological report that was due in class the next day. Bird by bird, buddy. Just take it bird by bird. As a college undergrad, I wanted to teach high school English. And not just because my professors seemed to think what they did was the only logical career option for their dear English students. Dead Poets Society had just come out and I was entranced by Robin Williams (aka Mr. Keating) whispering carpe diem, and standing on his desk to convey to his students the importance of seeing the world from different perspectives. Inspirational. Easy. I could do that, right? Throwing my 22-year old self into a teaching practicum for high school English was like a throwing a sheep to the wolves. I had some good qualities to be a teacher, but I lacked one skill that I believe all good teachers have. The ability to corral a group of young people and engage them, not with intimidation or coercion, but with a calm and assertive way of communicating. Knowing when to speak and when to be silent. But where do you find a voice? For the past 10 years I have volunteered as a lead coach for The First Tee, a program that teaches young people core values and life skills through the game of golf. It wasn’t until more recently that I have had a better command of my classes, which is something of a must when leading 2-hour classes of amped up teens through a 13-week program. Is this feeling simply due to having more experience and that, with experience comes confidence? Yes. But I felt I had found my voice, one that allows students to ask questions and explore their own games of golf, while also keeping them on task and creating boundaries in which to play and learn. So what does this have to do with poetry? Many years ago I gave a less than stellar open mic reading of a few of my poems. A woman in the audience approached me afterwards and said that she may have liked my poetry if she could only have heard me. How many times had you read those poems aloud by yourself, she asked. Not good enough, she said. And I never forgot what she said next. You have to read those poems 20 to 30 times by yourself before getting up to read them to an audience. Wow. She was ordering me to find my voice. Now, after many open mics and readings, and many hours of preparation by reading out loud to the walls in my house, I feel I have found something. Hopefully, it is one that others can hear, that engages them, and elicits a reaction. And for those of us who write, or teach, or coach, or, heck, simply speak, one that does justice to the hard work of crafting our art. The society Rudolph is born into is unforgiving to say the least. The North Pole is not for the faint of heart. Conformity isn’t optional. The rejection and ridicule is so intense that Rudolph sees no choice but to leave home. And unlike many of us, he doesn't walk down the block, come to his senses, and turn back around. Rudolph goes into the barrenness of the North Pole. Into the cold, unknown world of the Abominable Snow Monster. It is in this barren landscape that Rudolph meets other non-conformists: Hermey, a frustrated elf whose true passion is dentistry, and Yukon Cornelius, a silver and gold prospector who seems to have wandered slightly off course. None of them fit into the place they are in. Each is on a journey of self-discovery. The poet Li-Young Lee proposes that each of us has a composite self and a prime self. Our composite self is composed of external influences such as society and culture. Our prime self, on the other hand, is the part of ourselves that is absolutely unique; it is not divisible by anything or anyone. Both selves are crucial to our well-being. We need community and family, just as these things need us. We also need to understand who we are at our deepest level, which Lee calls the level of the unknown. The characters in Rudolph have decided to sacrifice everything for the sake of pursuing and protecting their deepest, most unique interests. They even work together to fend off the Abominable Snow Monster and, thereby save Rudolph’s family, the same folks whose rejection forced him to leave home in the first place. Lee says that art and poetry speak to the prime self in each of us. It is where the artist/poet in us lives. When we are in touch with the unknown we are open to all that artistic and poetic expression have to teach us. Let’s face it, artists are a different breed, and Rudolph and his friends are artists in their own way. Each of them is a misfit who undertakes both an inward and outward journey. The redeeming quality of these artists in Rudolph is that first, they have the courage to make the journey to connect with their prime selves. Second, they return to their community, not just with a better understanding of who they are and their place in the world, but with a gift to share. Rudolph guides Santa’s sleigh through a nasty storm and saves Christmas. Hermey offers to care for the teeth of his abusive boss. Yukon risks life and limb, not only to tame the Abominable, but to incorporate him into the larger community that had feared him so much. Yes, even a snow monster has a place in the world of an artist. I believe that each of us is an artist. We each have an unknown, prime self that is waiting to be discovered. For me, writing poetry connects me with my prime self. With my inner misfit. Writing poetry is like journeying into the unknown, getting lost, arriving at some realization or truth, and making my way out to the other side. Just as important though, is returning to the world of the composite self, whether it be to our families, workplaces, neighborhoods, or even Santa’s castle at the North Pole, more fully aware, more fully realized, ready to share ourselves and our gifts with those around us. I have taken this maxim to heart when writing and publishing poetry. But, when people ask me what kind of poetry I write, I have to stop and think. A lot of my poems are about childhood memories that pop into my head while walking the dog. I guess I would call it confessional. Or narrative free verse. I write about how my father used to balance an almost empty glass ketchup bottle (before plastic squeeze bottles) onto a new ketchup bottle to salvage the last slug of ketchup from the old bottle. I write about how my mother prayed with me toward the end of a basketball season in the hopes that I would just score a basket. I write about my high school geometry class, how my parents met, and my wife and I installing a faucet in the kitchen sink. The past 2 years, I have led a poetry workshop with the poets Tara Lynne Groth and Bartholomew Barker, at the Holly Springs (NC) Cultural Center. Tara Lynne and Bart are experts at using prompts such as old post cards with actual messages written on the back, and 12-sided (or, if you prefer, dodecahedra) dice to prompt the audience to write about a particular month. Their prompts always get my poetic juices flowing. For me, I have the audience think back on significant (or less significant, but memorable) moments in their lives. I will share the details of this in a future post, but suffice it to say, there is a wealth of material in our personal histories. This is where I often go for my poems and the good news is that this store of ideas is growing every day. So, if you find yourself racking your brain for poetic subject matter, you may be, as the mythologist Joseph Campbell said, standing on a whale fishing for minnows. ​Just write what you know.